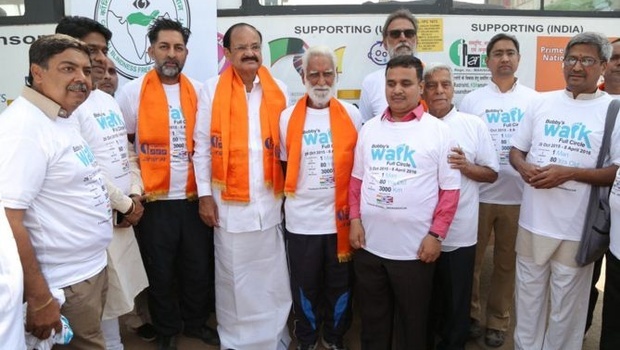 An 80-year-old NRI based in the UK today concluded his 3,000-km walk from Kanyakumari to Delhi to spread awareness about blindness and raise funds. Balwant Singh Grewal was received at the India Gate here by Urban Development Minister M Venkaiah Naidu who felicitated him for his accomplishment. Grewal said his walk has generated substantial awareness about blindness. At a gurudwara in Nagpur, about 200 women came forward to donate their eyes, he claimed. Naidu termed his initiative as “inspiring and commendable” and said it would inspire many to come forward to donate eye. The minister said the government has been taking several measures for the benefit of the differently-abled to make them realise their inherent potential. Grewal, who heads the UK-based charity India Association, started the walk on October 26 last year. The fund he collected during the course of his walk will be donated to ‘Saksham’, an organisation working for the cause of the blind, and the Prime Minister’s National Relief Fund.